Craze of using i Products is increased tremendously in last few years. But there is one thing for which we all will agree i.e. we can not tweak iPhone as much as we can tweak an Android device. But we can customize iPhone as much we can customize an Android smartphone. So the only solution to this is Jailbreak Your iPhone. As android users need to root android phone for system access similarly iPhone users need to jailbreak iPhone. Jailbreaking your iPhone is a risky task which Apple opposes. Once you Jailbreak your iPhone, and you face some problem, Apple stores would not help you out even in Warranty. We do not recommend it either but Jailbreaking of iPhones is quite a popular topic among youngsters. Jailbreaking means bypassing the locks put in place by Apple on its iPhones and iPads and thus gaining access to a large number of apps that Apple hasn’t authorised. Anyhow We will surely tell you guys How to Jailbreak iPhone. We are firstly going to give Some basic knowledge about Jailbreaking process which most of the people do not know about. There Are Two types Of Jailbreaking. How To Jailbreak iPhone Or iPad ? Tethered jailbreak requires you to attach your iOS device to your computer and run an application to jailbreak it. Later if you power off the iPhone and then restart it, the jailbreak will not be in effect, and you have to repeat the entire process. It also means your iPhone is completely useless until you do so, which isn’t convenient at all. These kinds of jailbreak were the first to be developed. The hack would remain in effect even if you switch your device off and on again. You can easily Jailbreak iPhone Using a tool on Windows OS or Mac OS. The method I am going to list below is for iOs 9.0 and 9.1. People who have their iPhones running on iOs 9.2 have to wait for sometime as Apple fixed the security flaw which hackers used to Jailbreak iPhone. Users who are aiming should make sure that they have latest version of Pangu and iTunes installed in there computers. To Download Pangu Windows users Click Here. To Download Pangu Mac users Click Here. For downloading iTunes Windows & MAC users Click Here. Installed both software’s on your computer? Now you are good to go. Now follow below written steps to Jailbreak your iPhone. Backup your Data – This is the first step users should do. You can take backup of your device using iTunes or iCloud. It’s a good option to back up your data rather then repenting later if data loss took place. Disable find my iPhone app – If you want your Jailbreaking process to be successful then disable “find my iPhone” app. Disable Touch ID or Passcode – Just disable Touch ID and Passcode or any other security so that Pangu can get in your iPhone and do it’s job. 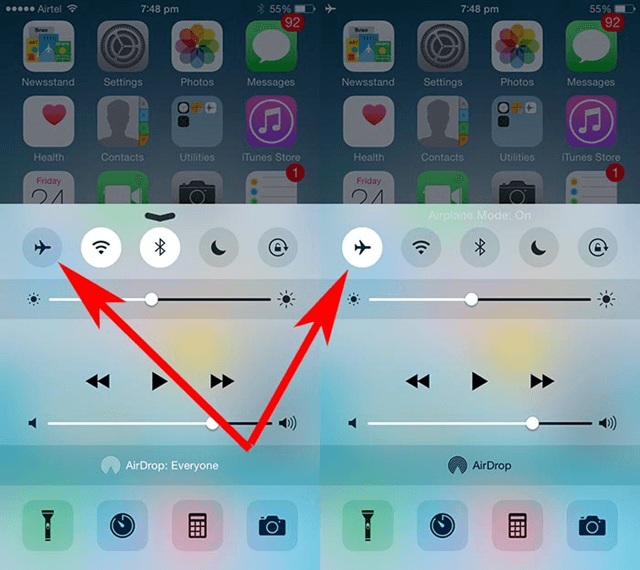 Activate Airplane mode – Another thing you got to do is, enabling the Airplane mode by opening control center by swiping from bottom of screen and clicking Aeroplane icon on iPhone. Launch Pangu – After completing above written steps, you can open Pangu software in your computer. Windows users should open Pangu as Administrator. Mac users can open the software as they normally open other softwares. Plug your device in Computer – As you will plug-in your device in computer, Software will automatically detect it. Once it detects it, click on Start to start the Jailbreaking Process. Your iPhone will boot – As you will see “Jailbreaking Complete” on your Pangu software, your device will reboot and display CYDIA, the jailbroken ‘app store’, on your homescreen. Allow access to Photos – There is a possibility that Pangu will ask you to give it access to Photos. Perfect! You are done. Now Disable Airplane Mode, open up CYDIA, and you’re free to download and install the various apps and tweaks which Apple does not allow. Once you uninstall all of the above stated software’s, Reinstall iTunes, Run Pangu again and you will able to get through the process. Do let me know in the comment section below if you were successfully able to Jailbreak iPhone and Other ios devices.